With six hundred members of crew filming in fifty countries over four years, the directors that brought us the original Planet Earth and Blue Planet now take readers on a journey across all the globe’s different biological realms to present stunning visuals of nature's most intriguing animals in action, and environmental change on a scale that must be seen to be believed. Featuring some of the world's rarest creatures and previously unseen parts of the Earth―from deep oceans to remote forests to ice caps―Our Planet takes nature-lovers deep into the science of our natural world. 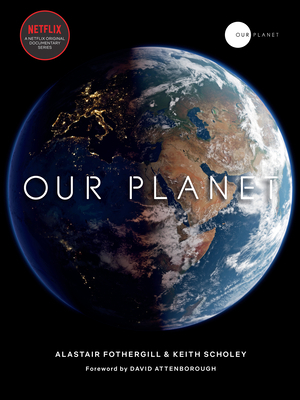 Revealing the most amazing sights on Earth in unprecedented ways, alongside stories of the ways humans are affecting the world’s ecosystems―from the wildebeest migrations in Africa to the penguin colonies of Antarctica―this book places itself at the forefront of a global conversation as we work together to protect and preserve our planet. With a keepsake package featuring debossing and foil stamping, this groundbreaking coffee-table book reveals the most amazing sights on Earth in unprecedented ways. In his almost thirty-year tenure at the BBC Natural History Unit, ALASTAIR FOTHERGILL was responsible for the landmark series The Blue Planet, Planet Earth, and Frozen Planet, among a range of productions. Since 2006, he has also worked for Disney, directing six wildlife movies for its Disneynature label. In 2012, he set up Silverback Films with Keith Scholey, which produced The Hunt series for the BBC and Our Planet for Netflix, the first natural history Netflix original documentary series. This book is Fothergill’s fifth. A fellow of the Royal Geographic Society and recipient of its gold medal, he also has honorary doctorates from the universities of Durham, Hull, York St. John, and Bristol. He lives in Bristol with his wife, two sons, and two Jack Russell terriers. Raised in East Africa, KEITH SCHOLEY studied zoology at the University of Bristol, gaining both a BSc and PhD. In 1982, he joined the BBC Natural History Unit as a researcher on the David Attenborough series The Living Planet. Later he became a producer and then series producer, running series including Prisoners of the Sun, Wildlife on One, and the Wildlife Specials and creating and producing Big Cat Diary. In 1998, he became head of the BBC Natural History Unit and subsequently controller of all BBC Factual Productions. He is now is the joint director of Silverback Films, based in Bristol, where he has directed and produced three Disney nature feature films--African Cats, Bears, and Dolphin Reef--and been responsible for the Discovery series North America and Deadly Islands and the Netflix original documentary series Our Planet. An author and journalist based in London, FRED PEARCE is a former news editor of New Scientist magazine, and he has been its environment consultant since 1992, reporting from eighty-seven countries. He also writes regularly for the Yale Environment 360 and the Guardian, as well as other UK newspapers. He won a lifetime achievement award for his journalism from the Association of British Science Writers in 2011 and was voted UK Environment Journalist of the Year in 2001. His recent books include Fallout, The New Wild, When the Rivers Run Dry, Earth: Then and Now, and Confessions of an Eco Sinner, which have been translated into twenty-four languages. "This stunning new book reveals the secrets of our water planet. . . .The plant and animal life adapted to each environment are depicted in beautiful photographs. . . .The informative text is conversational and highly readable."